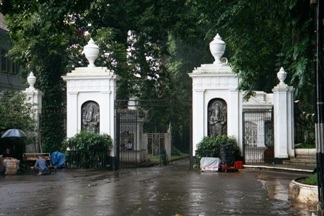 Bogor, a lovely city to stay despite the nickname city of rain 'kota hujan'. The weather is very nice and cool. The nickname doesn’t come from the air. The city has literally the highest annual rainfall of Java. But the weather is very nice because the height location of the city, about 290 meter above the sea level. It's worth of visiting with the famous botanical garden, and has nice cool weather. It’s like a breeze compare to Jakarta heat. It's easy to reach from Jakarta, it's about 60 km away, while from Bandung is more than 100 km. So, if you don't like the capital city of Indonesia, but you need to take care of something or doing some shopping, stay overnight here. It's more convenient and less crowded. You can fully enjoy your staying here without even bother to traffic. This is more easy going town. Located at the heart of Bogor. It has a big area of 100 hectare. It’s really a great garden inspired by Raffles. It’s lovely garden contains stream and lotus ponds with more than 15,000 species of trees and plants. And not to forget they have the magnificent palms, more than 400 types. And enjoy the biggest flower in the world ”Rafflesia”. And not to mention the beautiful orchid garden with more than 200 varieties. I think you would have a great time here. If you love plants, one day isn’t enough to explore all the magnificent plants and orchid. Don’t visit this place on Sundays, forget it, it’s always crowded on that day. Choose another day and you would have a nice and great day, far from the crowded and hassle of Jakarta. 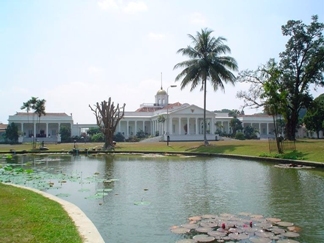 If you going further up to the north west of the Botanical garden, you will find a beautiful palace, called Presidential palace (or Istana President in Indonesian). Built in 1745 and formerly this place was mean for the residence of the Dutch governor general, G.W. Baron van Imhoff. In 1870 the palace became official palace of Bogor with collection of more than 219 paintings, sculpture, ceramics, some antique. This is a museum with the collection of skeleton of Blue whale, and other interesting animals skeleton from 1 million years ago, from the history of Sangiran ( Central Java). In this place you’ll also find library of rare botanical gardens books and stone collection. If you drive from Bogor to Puncak, about 10 km further from the city you’ll find the picnic spot and small waterfall around this small town, Cisarua. Lovely place to visit after hours driving. On the way up to Puncak stop at the huge Gunung Mas Tea Plantation for a free tour. Walking through the tea plantation to Telaga Warna (colored lake), a small lake with many colors just below the top off the Puncak pass. The lake has colored that reflects the day light, sometimes the lake become yellow, or green, or even red. 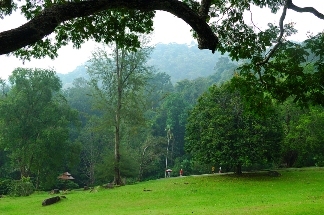 Located about 18 km north east of Bogor. Make a walk through the rice field from the village of Ciampea you’ll find the site of a huge black stone which King Purnawarman inscribed his name and footstep. For local people this lovely town is very famous with their rujak, mix of vegetables and fruits in sour sweet sauce with nuts. They're delicious. Many people from Jakarta or Bandung go through this city just to buy this. Don't forget to taste the rujak. I bet you will like it.